A three bedroom end of terrace home set on a corner plot, comprising lounge, dining room, refitted kitchen, three bedrooms, bathroom, double glazing, southerly facing rear garden, garage and driveway, side plot garden with potential to extend (stpp), viewing highly recommended. 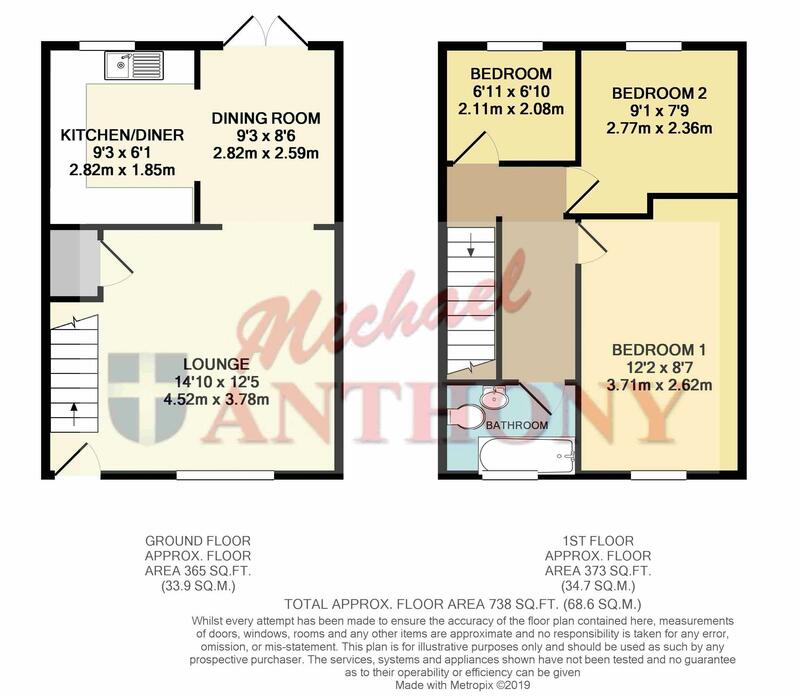 Double glazed window to front aspect, television point, understairs cupboard, stairs rising to first floor, electric storage heater, archway to dining room. Double glazed patio doors to rear garden, electric storage heater, archway to refitted kitchen. Double glazed window to rear aspect, refitted kitchen (fitted in 2015), a range of storage cupboards at base and eye level, solid wood butcher block work surfaces, fitted oven, induction hob with cooker hood over, stainless steel single drainer sink unit with mixer tap over, complementary tiling, fitted fridge freezer, plumbing for a washing machine, fitted microwave. Double glazed window to front aspect, electric panel heater, a range of built in wardrobes. Double glazed window to rear aspect, electric panel heater. Frosted double glazed window to front aspect, a white suite comprising a panelled bath with fitted shower over with glazed shower screen, low level w.c., wash hand basin, electric heater to wall. Driveway for several vehicles to side, leads to singled detached garage with up and over door. Laid to lawn with shrub border, power and lighting points, eaves storage to roof void. Southerly facing rear garden with indian sandstone patio, laid to lawn with flower and shrub borders, outside tap, gated side access, side plot garden, laid to lawn, potential to extend (STPP).